WOW! At first it was the way you handled the reflections and the water that attracted me. The green on the water edge is perfect. But the more I look at it the trees are equally fantastic. Beautiful painting! 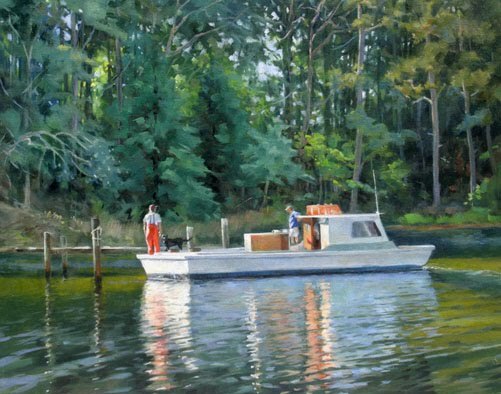 Chuck, excellent handling of the reflections and shadows giving a sense of movement throughout the painting. 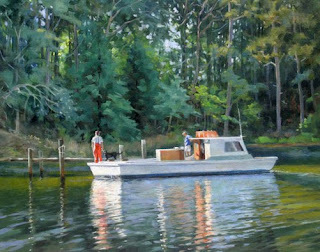 The little touches like the bright highlights on the dog and the fisherman make this painting come alive. The reflection and ripples in the water are so true. At first glance I thought it was a photo.